CNR-Live is a specialized interface device that connects real PTT radios into a computer network of simulated radios like CNR-Sim. CNR-Live connects to the computer network using standard Ethernet. No additional hardware is required. CNR-Live's software, running inside the CNR-Live box, manages all the issues of bidirectional voice comms between the real radios and the computer network of simulated radios. If a PTT handset or headset is connected (as shown above), CNR-Live will respond to the action of the PTT switch. Alternatively, CNR-Live can be configured for VOX operation with an external handset/headset. Through an easy to use GUI, CNR-Live users independently map each real radio to any of the simulated radio channels. For example, external radio #1 could be mapped to simulated channel "Bravo Brigade" while external radio #2 could be mapped to a different simulated channel "Charlie Company". In that example, all communications on channel "Bravo Brigade" would be heard by all simulated radios (e.g. CNR-Sim radios) tuned to receive channel "Bravo Brigade" and also heard by everyone outside who are listening on real radios tuned to the frequency of the real radio that's been mapped through CNR-Live to the simulated channel "Bravo Brigade". If CNR-Log were running on the network, all comms, whether from simulated or real radios, would be logged for later playback. Standard Ethernet network interfaceConnections for four (4) external radios. The CNR-Live box is fitted with U-183 connectors that mate to cables with standard mil-radio U-229 end-connectors. 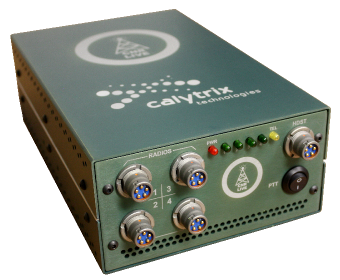 Calytrix packages two radio interconnect cables with each CNR-Live.Connection to an external PTT-style handset/headset. The CNR-Live box has a U-183 panel mount connector that mates to the handset's U-229 connector. Calytrix packages one handset extension cable with each CNR-Live.